We are proud and honored to service wedding parties! We know that your wedding can be the most important day of your life- and looking flawless for your photos, and as you walk down the isle just makes that whole day feel more magical! 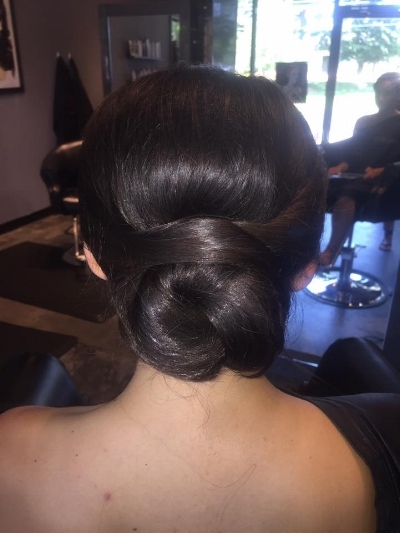 We provide hair and make up services for Brides and wedding parties both in salon and off site. -We provide on and off site hair and make up services for your wedding. If you are local, we highly recommend considering using the salon. You may bring your snacks and beverages, we will play your favorite music and get cozy! The salon provides us with ample room, plenty of mirrors, outlets, equipment. shampoo stations for those getting blow outs, and adequate lighting for make up! -Bring several photos and options! Your first choice may not be a match for your hair texture or type. Also be sure to have front view photos. Many hair photos show us updos from the back, but how your hair frames your face is very important for your big day! -We strongly recommend booking a trial! it is certainly not required, however, it is not always ideal to see your hair for the first time on your wedding day. -The day of your event your hair should be slightly 'dirty'. Freshly washed hair can be slippery and not hold styles as well. If your hair gets oily quickly, freshly washed if fine. Always arrive with dry hair. If you are curly, have if blown smooth but never flat ironed. -A deposit is required to reserve your date. Call the salon or email Raquel@riverheadsalonn.com to inquire dates. There are additional fees for offsite (depending on mileage) or after hours (Sundays or early morning) weddings. Deposits are non refundable and go towards to the services for your event. -This is your day! let us know how we can help you! Don't hesitate to ask for what makes you feel the most comfortable! Congratulations!